More than a dozen prominent colleges around the country broke records this year for the number of applicants they enticed. Because in one way or another, they proudly (and sometimes quickly) announced it. Never mind that more applicants mean more people to reject, and that the schools are ginning up desire merely to frustrate it. Sending out those rejection notices is part of the point. It's part of the boast: We are hard to breach and possibly out of reach. The exclusivity only makes students want the colleges more. And so New York University trumpets its new milestone in applications, the "largest increase in 15 years," according to a headline on its website. Colby College publicly thrills to its bounty, the result of an intensive recruitment effort that was the talk of higher-education circles, because it struck many observers as such a bald attempt to raise the school's stature not through the classroom but through the admissions office. Colby saw a 47 percent surge in applications, from 5,148 during the last admissions cycle to 7,591 during the current one. This is according to a college news release that simultaneously crowed about the extra staff and extra energy that Colby had devoted to the pumping-up of applications. Like many schools, it said that it was merely trying to construct the most talented and most diverse class of freshman that it could, and there's no doubt something to this. But there's more at work in the record application hauls at Harvard, Emory, Princeton, U-Penn, and Bucknell. There's marketing; optics; bragging rights. Will Harvard's announcement of an unprecedented number of applicants be followed by an announcement of a lower-than-ever acceptance rate? Stay tuned. We'll know in a week or two. Last year its rate wasn't as daunting as Stanford's, which hit a new milestone of exclusivity: 5.1 percent. Are Stanford's rivals, reputation-wise, intent on matching that? That question underscores one of the forces fueling the epic levels of anxiety that now surround the college admissions process -- at least for kids privileged enough to have options, to be able to worry about more than whether they can afford tuition and whether their educations until this point have properly set them up for college. It can't be divorced from a chapter of American life and a corrosion of American discourse in which not just Chevrolet and Cartier but everyday people worry about their "brands," and in which everything imaginable is subdivided into microclimates of privilege and validation. At the amusement park, you can do general admission or a special pass or an even fancier package that puts you instantly at the front of every line. At the Equinox fitness chain, trainers are designated by numbers -- Tiers 1, 2 and 3 -- that signal their experience and hourly rate, and there are deluxe hideaways within certain Equinox clubs, which use eye-scanning technology to figure out who belongs. In the plane, it's no longer just first class and coach. For a surcharge, there's extra legroom. For frequent fliers, there are exit-row seats, early boarding and first dibs on the overhead bins. You ascend and cling to a designated stratum with designated perks: gold, silver, platinum, diamond. In the United States circa 2015, it's not just shoes, handbags and SUVs that signal your status and how enviable you are. It's a whole lot else, and colleges have climbed higher and higher up the list--against all reason, and with needlessly hurtful consequences. The temperature of the admissions process is also turned up by the existence of a test-prep industry that's become a behemoth and by the emergence and growth of a whole new class of professionals: private college admissions consultants -- or coaches. They're multiplying fast. The cost of college greatly aggravates the situation. Parents poised to spend as much as $60,000 a year on tuition, room and board want whatever's deemed to be the luxury model and push their kids to attain it, while the children of the much greater number of parents who can't swing a bill that enormous vie for scholarships whose acquisition and generosity hinge on board scores and GPAs higher than those of their peers. On top of that, social media has given kids ways to keep track of one another and to issue widely seen bulletins about their lives that didn't exist before, and what kids often want and choose to do with those bulletins, whether the news is related to college or something else, is impress. Check out the Facebook pages of high school seniors around the days that early-admission or general- admission notices are released, and you'll see a blizzard of up- dates communicating who got in where. The process, like so much of modern life, is public as never before. And hovering over all of this is the economic pessimism that has afflicted this country for at least a decade now, along with the growing sense of income inequality. There's a sense that the world is more competitive, that the future is more uncertain and that the gap between haves and the have-nots has widened, raising the stakes of which side of the divide you wind up on. Alan Krueger, an economics professor at Princeton, told me: "The difference between being in the top one or five or ten percent and not is bigger than ever before, so if people think going to a highly selective school will get you there, they're going to care more." Catharine Bond Hill, the president of Vassar College, added: "The reward of getting into the top X percent of the income distribution now is a multiple of what it was thirty or forty years ago, and people perceive the access to that as coming through these elite schools." In other words and in sum, the college admissions mania is a mirror of America: anxious and stratified. 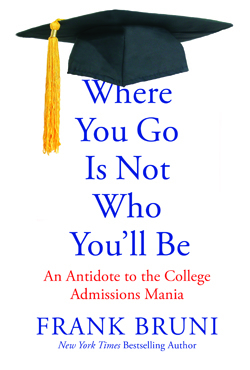 Frank Bruni, an Op-Ed columnist for the New York Times, is the author of the new book, Where You Go Is Not Who You'll Be: An Antidote to the College Admissions Mania, published this week.